Dame's Rocket Hesperis Matronalis is a herbaceous biennial or short-lived perennial plant that is a member of mustard family. 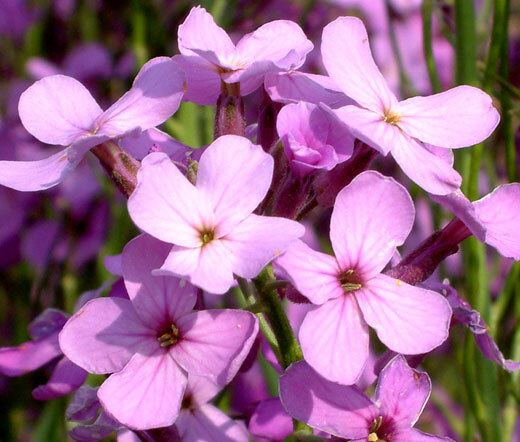 Dame's Rocket seeds are easy to grow and they can be started directly outdoors. Some of the other common names of this beautiful perennial are Sweet Rocket, Summer Lilac, and Winter Gilliflower. Dame's Rocket blooms with large, loose clusters of fragrant, deep-purple through all the paler lilac shades to white flowers. The Dame's Rocket blooms from spring to summer, and its scented flowers release sweet fragrance that is most pronounced in the evening. The blooming Hesperis Matronalis attracts masses of bees, butterflies, and birds. Dame's Rocket has been grown in gardens since the Roman Empire, and this ornamental perennial is the excellent plant for meadows, naturalized areas or cottage gardens. Sweet Rocket habitats include woodland edges and openings, thickets, semi-shaded fence rows, banks of drainage ditches, vacant lots, and edges of yards. Hesperis Matronalis seeds produce the dependable perennial or biennial plant that likes to grow in moist conditions, but Summer Lilac adapts easily to the less than perfect growing environment. If Dame's Rocket plant is left to seed itself, it will gradually naturalize over a large area.